National DJ Day might celebrate the work of our favorite disc jockeys, but it stems from the work of ONE famous jock: Alan Freed, whom you might know as “Moondog.” This 1950s DJ, who coined the term “rock and roll,” is the reason we honor DJs on January 20. On this day, we celebrate the talents of all the disc jockeys, from those playing the “Chicken Dance” for the millionth time at a wedding, to the radio personalities who help you get through the morning commute. Despite high ratings, New York's WNBC Radio famously fired the controversial "shock jock" after a little over three years on the air. Stern would eventually take his show to satellite radio and go on to become one of the most successful radio personalities of all time. Freed, a DJ pioneer, played a mix of blues, country and R&B. What did he call it? Rock and roll! Freed arranged live concerts attended by racially mixed audiences in the 1950s — a breakthrough at the time. He also appeared in several movies. California's Ray Newby was a 16-year-old college student when he played records from a small transmitter. This predated the term "disc jockey," which wasn't used until decades later. Phone in your favorite radio show and request your favorite song. While you're on the phone, make sure the DJ knows that YOU know it's National DJ Day — and say "thanks." Grab your spouse, kids, or best friends and blare your favorite music. Have an impromptu dance party in your living room. Hop on Twitter or Facebook and post about #NationalDiskJockeyDay. Tag a favorite DJ and/or radio station, and make sure they know how much you appreciate their work. Iceland hosted its Secret Solstice festival in 2015 at a temporary club in a glacier. The Tree House Club, in Nairobi Kenya, fits 1,000 people. Klub 20/44 is on a rickety barge tethered to a bank on the Danube River. Cova Santa cave in Ibiza is more than 80-feet deep, and it still has the pirate lair from five centuries ago. You can rent out the Maldives' Subsix restaurant as a club, which rests on a coral reef nearly 20 feet underwater. The morning commute can be a drag, especially in the dead of winter. Morning show DJs can keep us alert and awake — all while spinning our favorite tunes. 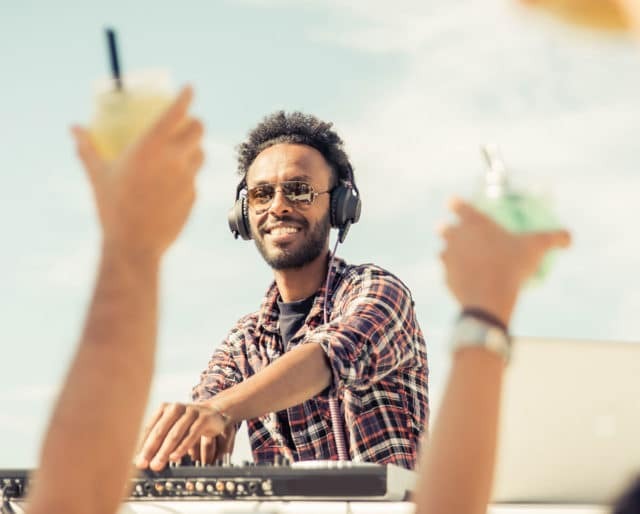 No wedding, bar or bat mitzvah, or celebration is complete without a DJ making sure our guests are having a good time. Once the lights dim and the music is pumping, the evening can turn magical. From the clapsticks of indigenous Australian tribes to the sorna and dohol, used in ancient Persian folk tunes, music has been a part of our DNA since the beginning. It's been proven to reduce stress, while improving both our mood and memories.